Wonder Woman (2017). Directed by Patty Jenkins. Finally, the elephant in the blockbuster, comic book movie room got a mention – that is to say, a female super hero at long last got her own dedicated feature film. Those of you who are regular readers will immediately understand this is a big thing for me and many other comic book movie fans. And let’s face it, after yesterday, female representation has been on my mind quite a lot! The fact that it came via DC and not from the Marvel Cinematic Universe was something of a surprise initially – I was hopeful that Marvel would’ve got the memo and given Scarlett Johansson her richly deserved Black Widow stand-alone film. Sadly, I think it’s very unlikely that will ever happen now, but I was heartened to see last week that Tessa Thompson (Valkyrie in Thor: Ragnarok) has pitched an all-women Marvel ensemble film to MCU production chief, Kevin Feige. And there’s Captain Marvel, starring Brie Larsen to look forward to in 2019. 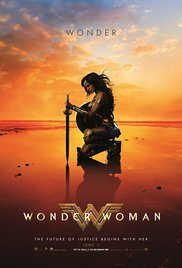 The first act is really great fun, the Amazons are fabulous with Connie Nielsen and Robin Wright excellent as Hippolyta and Antiope. In fact, I’d love to see a movie about them – that would be excellent! And I have to say, Gal Gidot is a joy. She is beautiful, athletic and admirably portrays that mix of strength and self-assurance against innocence and wonder, not an easy thing to balance. She carries the film and does it (where the script allows her) very well indeed. I know it’s expected to have a love interest in these kinds of mainstream films, but it disappoints me that she had to fall for the first man she sets eyes on. Chris Pine is suitably handsome, bland and heroic as Steve Trevor, but thankfully doesn’t overplay his role and is a good foil for Gidot’s Diana. To me, this immediately points to good direction from Patty Jenkins. The supporting cast are solid but the standout is the wonderful Lucy Davis, who steals every scene she’s in as Steve Trevor’s assistant, Etta Candy. For the most part, the fight scenes are reasonable and quite well choreographed but there are some very obvious CGI clunkers that took me out of the moment and reminded me that this is after all, a DC film. The final act however, and the “boss fight” descend into an overlong and almost turgid mess. I think this is something that has become an all too common feature of nearly all blockbuster comic book films in recent years, but I’m hopeful that the producers will get the message sooner rather than later and tighten up their endings. Coupled with this, the lighting and colour all ebbed away into the usual DC trademark dark blue grey tones. I don’t know who told them that these film tones signify “cool” and “edgy” but they’ve certainly been sold a lemon on that one! Overall, I was really impressed with the first two thirds of this film and Patty Jenkins is a director I’ll be watching now with interest. It’s just sad that the ending fell pretty flat after such a solid build up. This is a good popcorn flick and while it isn’t world changing, it’s certainly a step in a more equitable direction. More please!